This is the before. 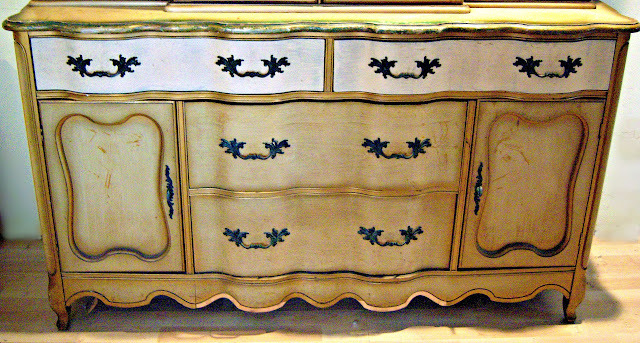 I like the lines of the buffet and its well constructed, but the doors and drawers are a little wonky. It's an old piece so I'm not that worried about slight imperfections. I painted the body in Talc by Martha Stewart paints and the top is painted in Magnetite also by MS paints, after painting I applied a coat of wax. I liked the patina of the original hardware so I just cleaned them up a little and put them back. Beyond the Picket Fence for Under 100.00 linky party. Gorgeous, Karen! Such a huge difference. 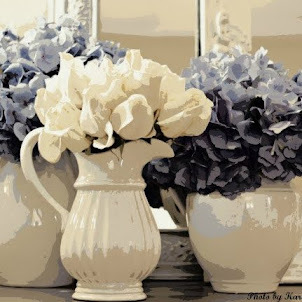 I also love the vignette you created! The candles, pitchers, and frames are all so pretty together! Love your curtains too! Absolutely GORGEOUS! I just love the hardware. I too love the picture with little Bijoux reflected in the mirror--so charming! Beautiful job Karen!! The look is so pleasing to the eye. Oh, it`s just beautiful. Love it and the frames. Looks good. I love the two colors they go well together. 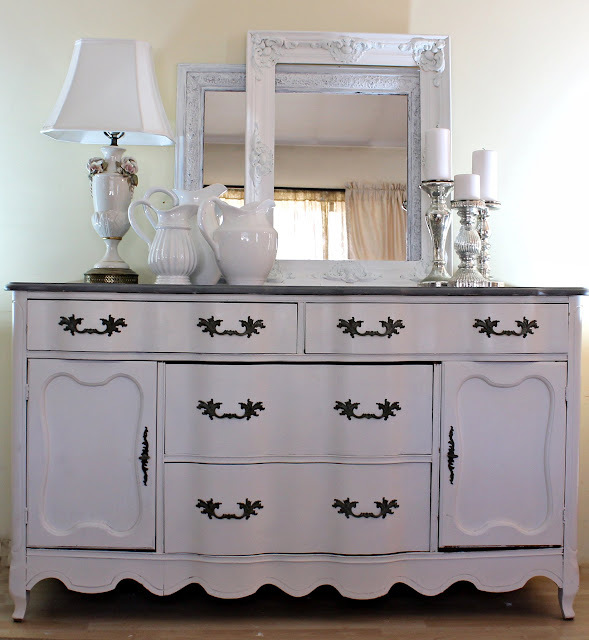 I love the way those dark drawer pulls stand out against the white of the buffet. Really well done!!! Your whole vignette is just lovely. It's beautiful. I like the vignette too and your little doggie in the mirror. I love it! Love the white and the mercury glass--the curtains look so pretty reflecting in the glass--great job! Wow, what a difference a little paint can make! :D Your buffet looks lovely. Nice job! Such a beautiful piece of furniture. You did a fabulous job prettying her up. It's gorgeous! What a difference! This is amazing my friend, so nice to catch up again. Hope you have a lovely day. This is stunning. I love everything. The buffet, the pitchers, the candlesticks, the mirrors. Really beautiful. I'm anxious to hear about your floors. I would love to put hardwood where my carpet is but not sure if I'm up to it...or can afford it! Delish! I'm lovin' it! I'm a new blogger and a new follower!! This turned out so lovely! Great job, you surely are a talented woman! Thanks for sharing and I just adore your blog! Oh my! That is absolutely beautiful! I love the way you painted the top a diffrent color. You did a fantastic job! Very Pretty! It looks like a totally different buffet, you did a great job. Love your blog, I am a new follower. Totally awesome!! You really did an excellent job! Hi Karen...stopping by again to thank you for your comment over at 21 Rosemary Lane. And again I will tell you how stunning your buffet is!!! Have a great week!! That is beautiful. Thanks for sharing at Wow. Beautiful! And you have it set up so pretty! I Love this ! It is just my style! Love what you did with the piece. I really like your vinett on the top too. Saw your link over at It's Overflowing. Love how this turned out and really adore the photo with your little dog in it. Very cool photo. That vignette is breathtaking Karen. I literally inhaled. Love what you did with the buffet, and of course, I love the frames. Oh this looks so great. I have a entry buffet that the 90's want back and I have got to paint, thank you for the inspiration! Hi Karen...I love how it turned out. I especially like the contrast between the dark top, dark hardware and the white. Awesome job. I love the white frames with all the details and the silver candle holders are gorgeous!! A very lovely buffet and you did it justice with the paint colors! I just love the photo with your pup's reflection in the mirror! Perfect! Beautiful! I love the color and your accessories too! WOW! You did great! The reflection of your dog is just too cute! 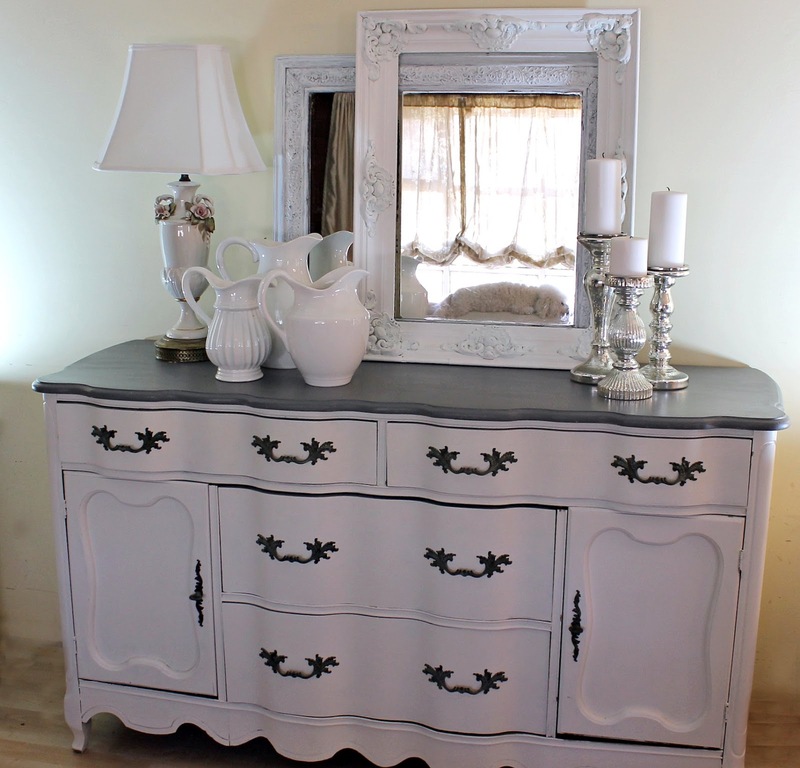 Love the dresser and love your blog! I am your newest follower! You did a beautiful job, it looks so different! Your buffet is so pretty! I love the new paint color on the top! Thanks for the sweet comment on my blog today! It just takes my breath away! Outstanding! I hope my furniture makes others feel that way! Thanks for your sweet comment about my bathroom renovation. 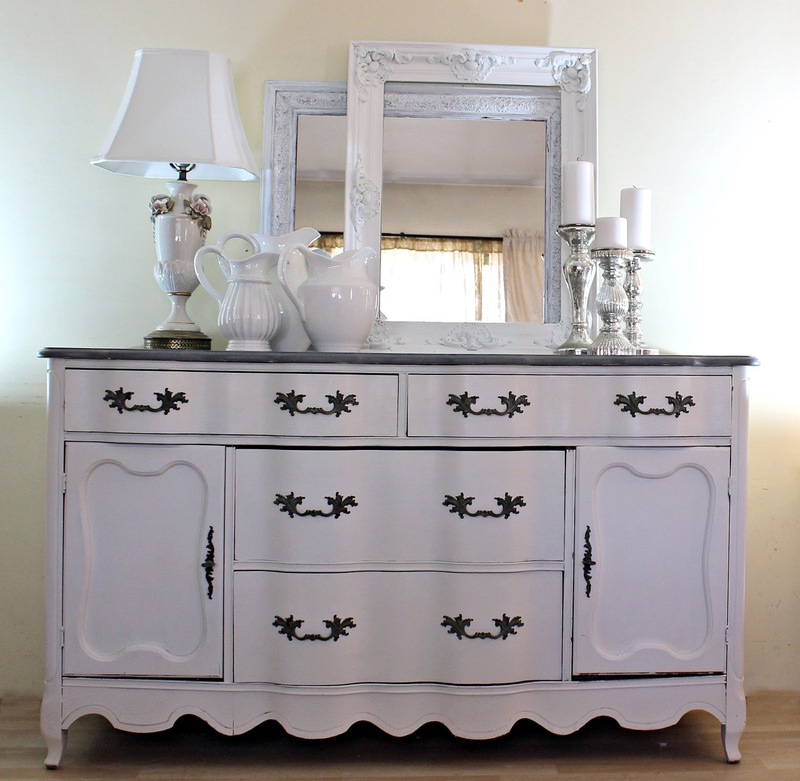 Your furniture posts from 2011 are beautiful! I am your newest follower. Thanks again! Karen, you did a beautiful job on your buffet. Gorgeous! I'm now following you. Stopping back by to say thanks for linking up at Feathered Nest Friday! Just beautiful!! I love the way that turned out. New Follower!! Looking forward to seeing more of your DIY projects. such a charming project, karen:0) love the colors you've used! What gave you the inspiration for the color?